Nathan Myhrvold won a PhD at age 23 in theoretical and mathematical physics. He then went on to--among a great many other things--work at Cambridge University with Stephen Hawking and become Chief Technology Officer at Microsoft. And then he wrote a cookbook. Not just any cookbook, either! His 6-volume compendium, entitled Modernist Cuisine: The Art and Science of Cooking, is a scientific examination of cooking techniques accompanied by recipes. It costs a hefty $460, but it's so popular that it's on back-order at Amazon. The scientist/chef has now ascended into culinary stardom. 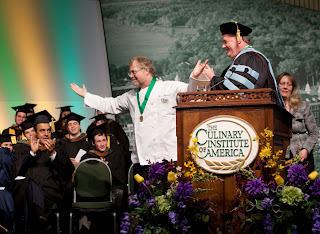 Fresh off visits to the Today Show and Colbert Report, Myhrvold came to The Culinary Institute of America (CIA) on Thursday, March 24, where he delivered the baccalaureate graduation address. During commencement exercises, Dr. Myhrvold was named an honorary alumnus of the college by CIA President Dr. Tim Ryan. While on campus, he gave a presentation attended by 1,000 students in the college's gymnasium and simulcast to classrooms on campus. Myhrvold's 2,400-page Modernist Cuisine is generating the biggest buzz in the food world in years. President Ryan was recently quoted in USA Today, calling it "one of the most important cookbooks of all time." Dr. Ryan has been in discussions with Myhrvold to consider how knowledge from Modernist Cuisine can be incorporated into the college's curriculum. Myhrvold told the families of the 64 graduates of one way the culinary world is changing: "Twenty or thirty years ago, if your son or daughter was a chef, you wouldn't brag about it at a cocktail party. Today you can brag." He then advised the recipients of bachelor's degrees in culinary arts management and baking and pastry arts management, "You've received the greatest culinary education anyone can receive. But it won't be enough. Today is not the day you stop learning. It's the day you start." Cooking is more than just a hobby for this Renaissance man. He won several first place awards at the World Barbecue Championships in Memphis, TN in the early 1990s and served as the chief gastronomic officer for the Zagat Survey. I saw him on Jon Stewart last night--what a wild and crazy guy! Looks like a fascinating cookbook. Yes, I'd love to see it - I think it will become the Larousse Gastronomique of the 21st century.